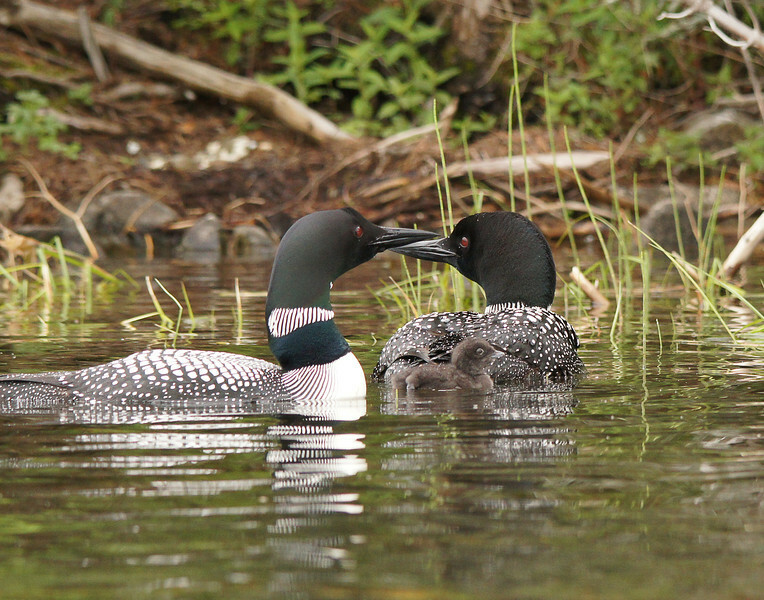 We went back to check on our friendly loons this week. 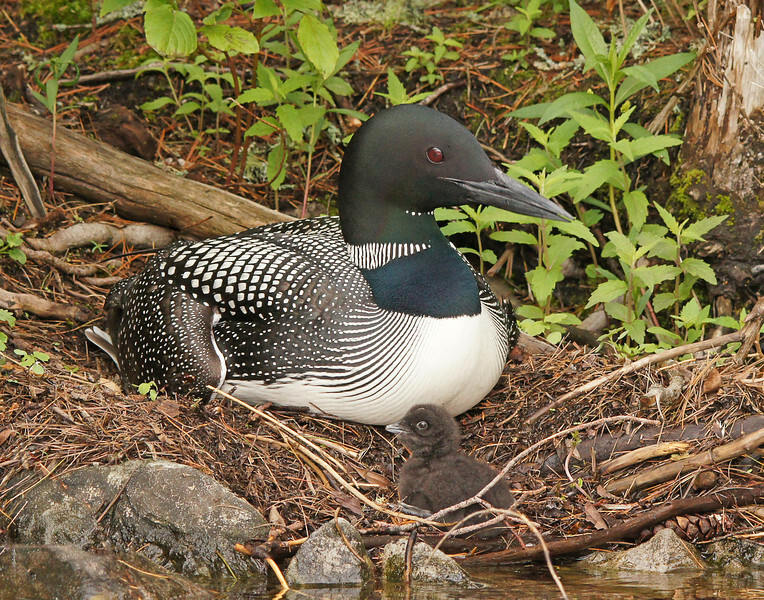 I thought that they might hatch over the weekend so Karla and I canoed into the lake on Saturday. 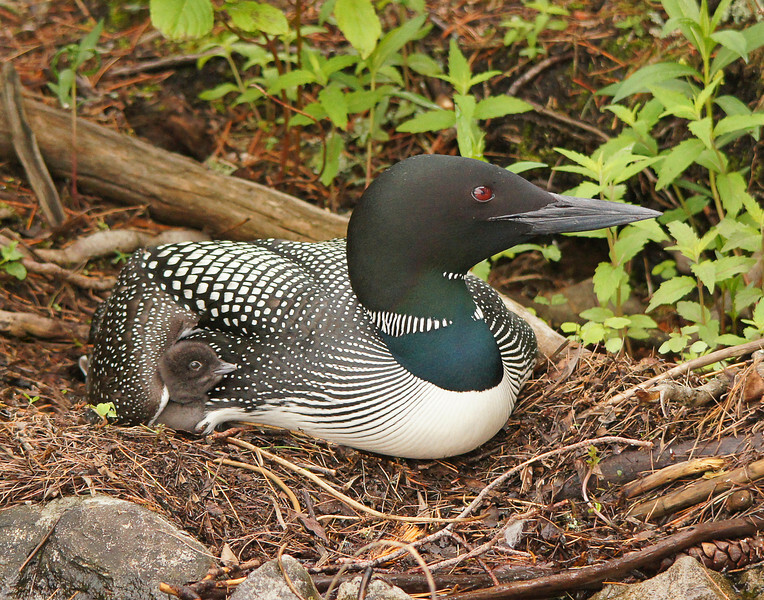 The mom was sitting on the eggs but no babies yet. 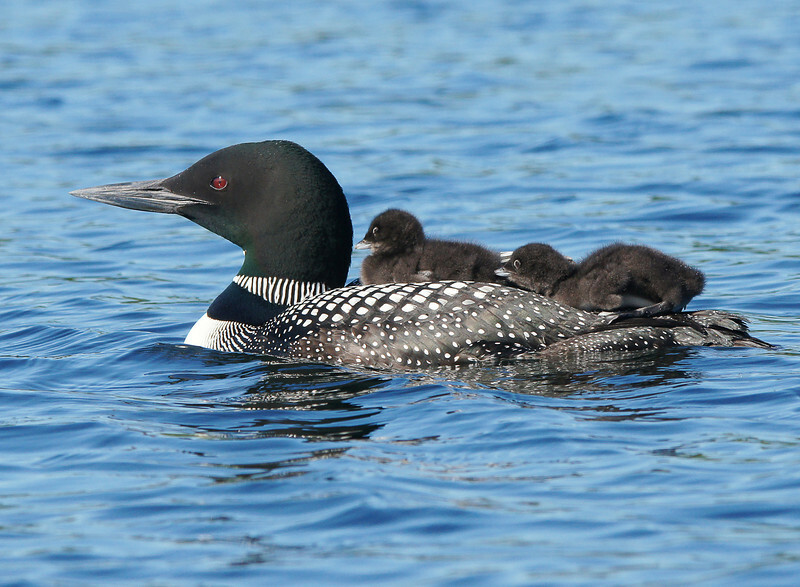 One of the loons came right up to our canoe. The water in this lake is crystal clear. 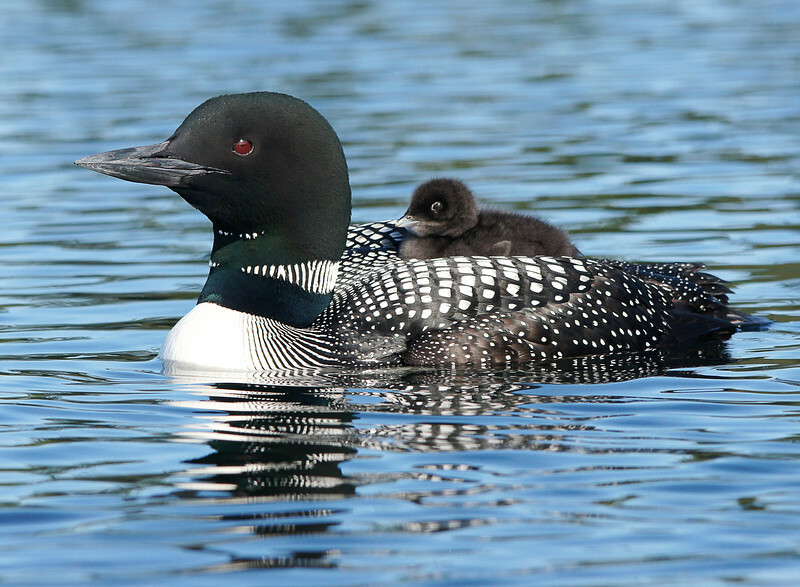 If you look close you can see why loons cannot walk as their feet are way in the back. I went back on Tuesday with Travis Novitsky, a photographer from Grand Portage. 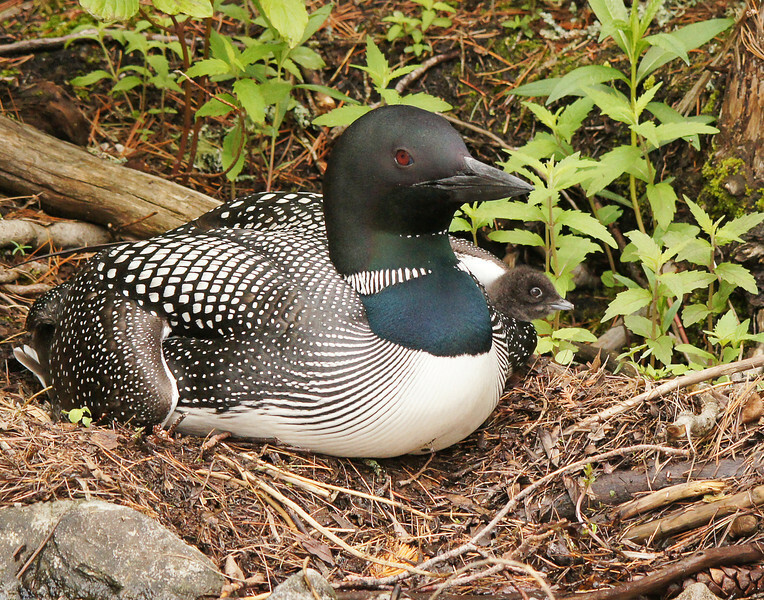 When we arrived mom was holding her wing a little high so we thought one of the eggs might have hatched. 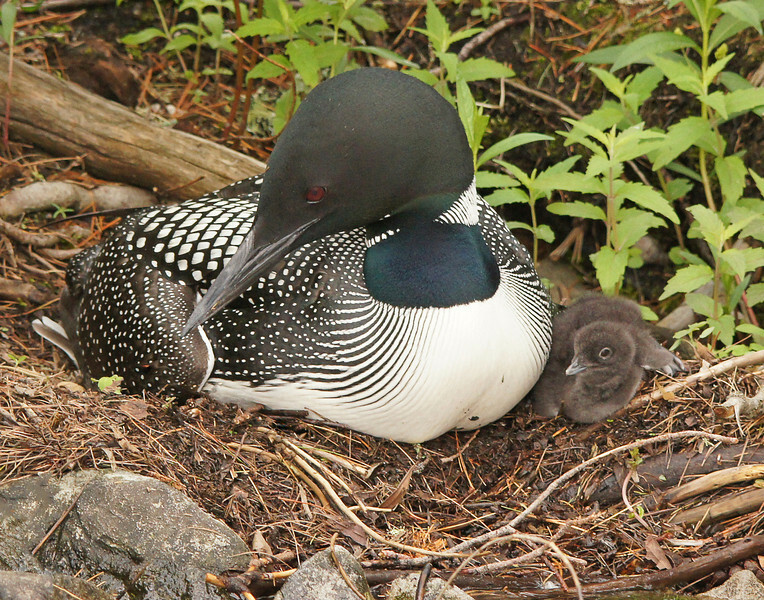 Pretty soon the head of a baby loon chick appeared from under her wing. We were both pretty excited. The adult stood up and rolled the remaining egg. We knew the other egg would hatch soon and we went to the adjacent island to have a snack and wait. When we returned she was holding both wings higher. Sure enough out comes the second head from under the other wing. What a thrill to be present when the chicks first appeared. The baby chicks moved around pretty well even though they were only hours old. They scooted around the adult and even tripped on twigs and fell into the water a couple of times. It was fun to watch the chicks explore a whole new world for the first time. Here you can see the nest in the background. We returned the next morning. Mom was in front of the island with chicks on her back. 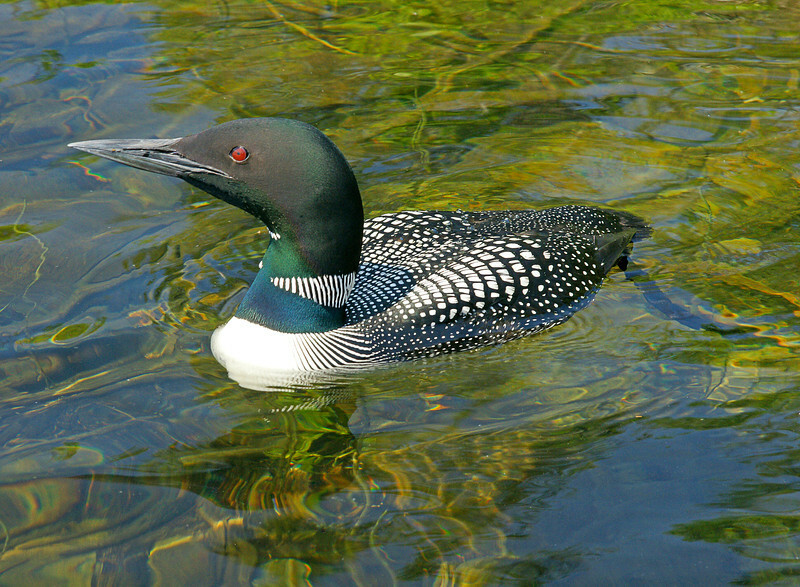 This loon is so friendly that she swam right by our kayaks. 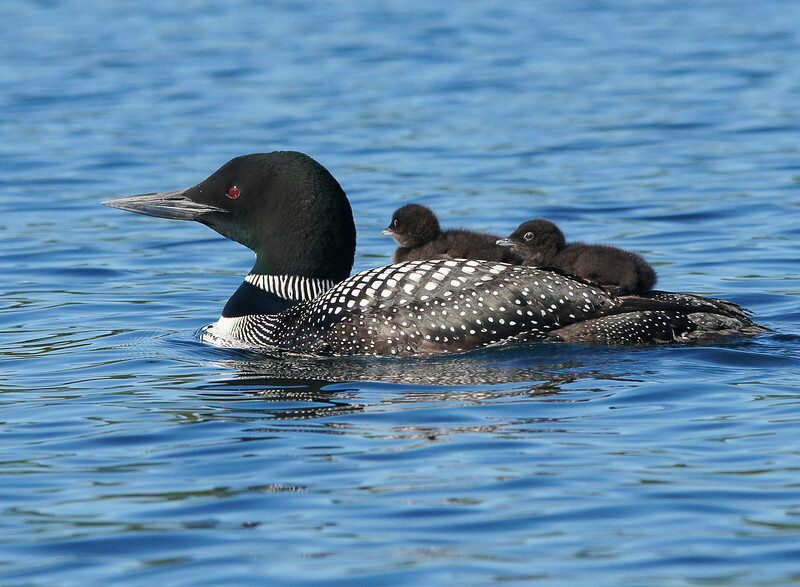 I can just hear the one little chick telling her brother to climb on board. Don't forget to go to page 2 by clicking next to see the rest of the images. Note how far back the little chicks legs are. Designed for swimming not walking. We watched for awhile and suddenly about 10 feet over our heads we hear the whoosh of wings. Dad came in for a landing. We had been watching them switch nesting duties but neither of us expected what we saw next. 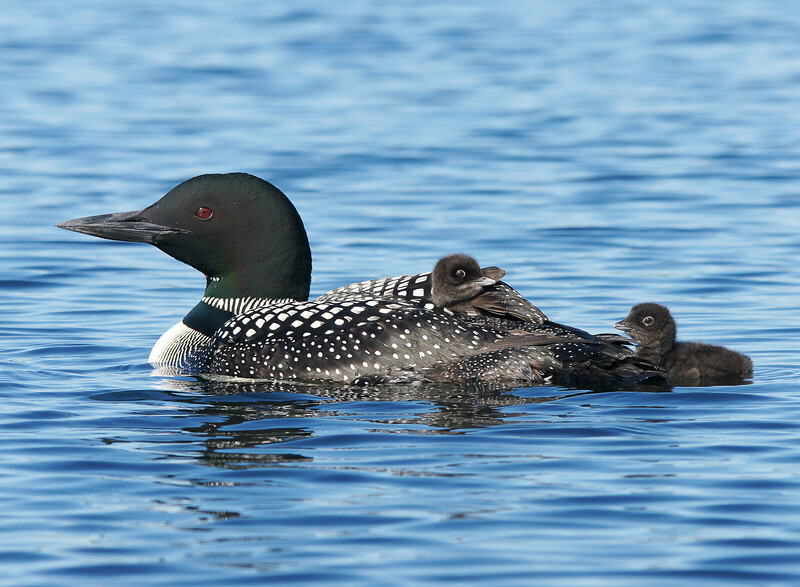 Mom reared up in the water and flapped her wings a couple of times sending the babies directly off her back and into the water. Then she moved over and dad came up and took over parenting duties. The little chicks climbed on dads back. When both adults were together they took turns diving and returning with what appeared to be very small minnows for each chick. It was exciting to see the successful hatch of two healthy chicks. The next few days will be critical. 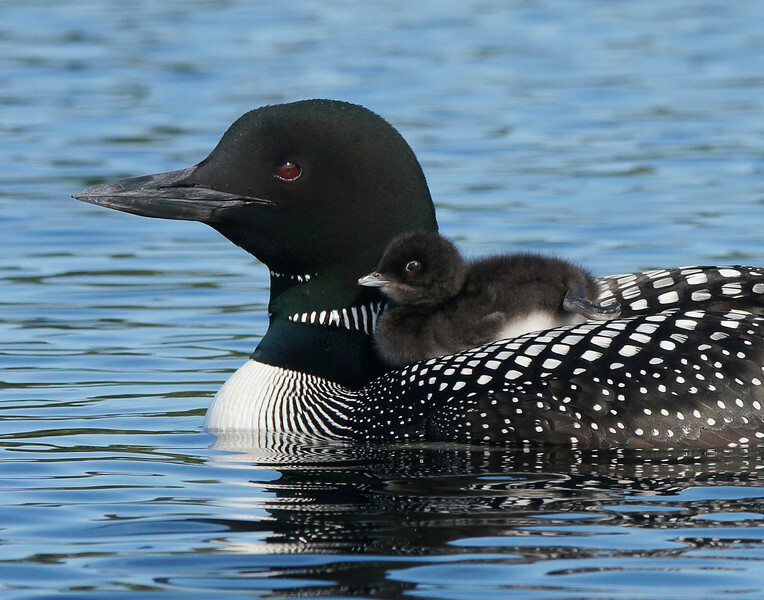 Their worst predators are eagles, gulls and the northern pike. We saw two eagles and five gulls fly over while we watched the loons. The parents did a good job of protecting the chicks. 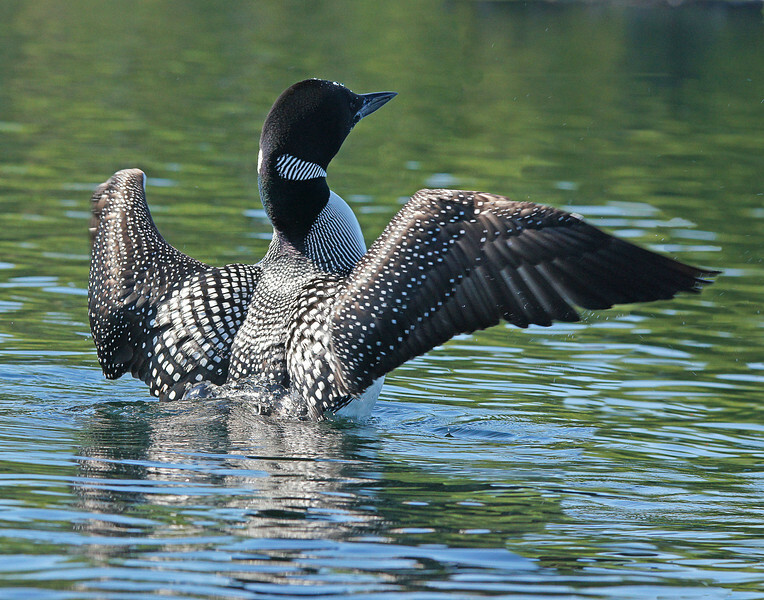 Loons will stretch their wings like this often. We even saw the baby chicks do this. 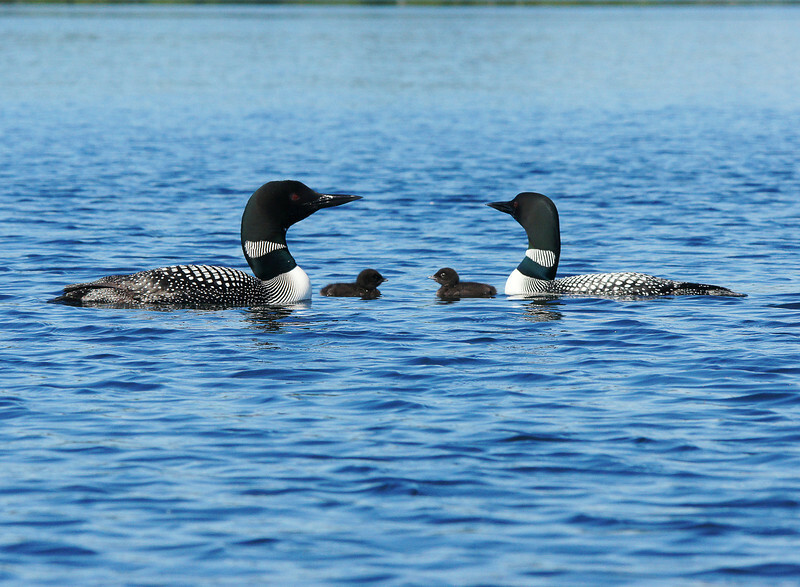 The adults got upset when two other loons flew their way. They took on a defensive pose, looked up in the sky and began calling. 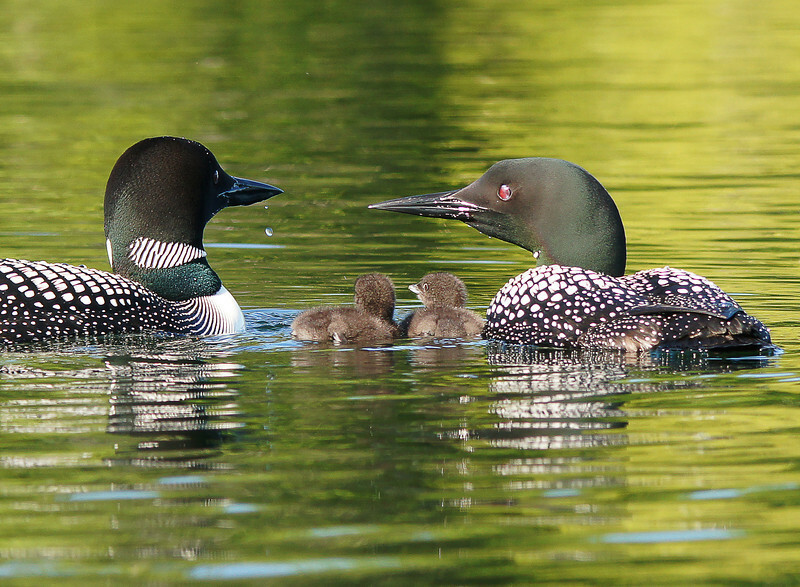 At first we wondered what had gotten them all worked up but then we saw the other loons. They must have awesome eyesight. I am sure they were informing these intruders that this was their territory and to keep out. 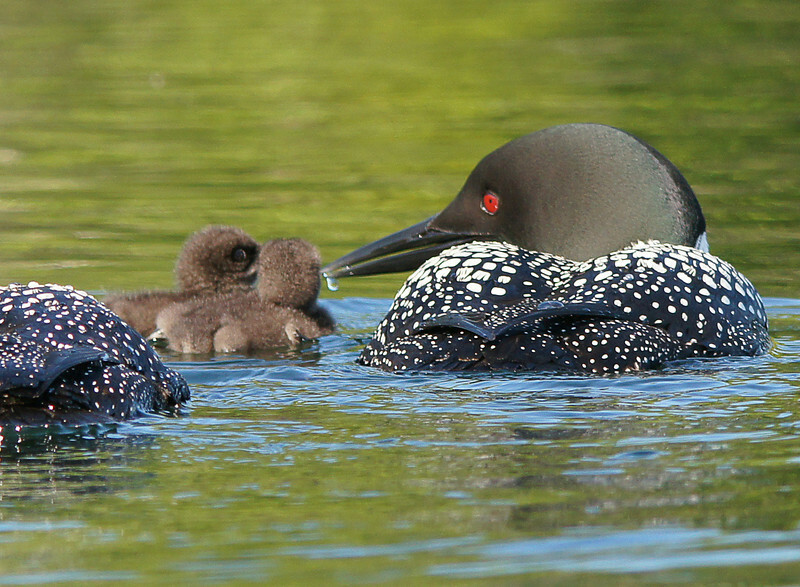 After the other loons were out of sight they returned to quietly feeding. Both Travis and I had to admit that this was one of the best wildlife encounters we have experienced in a lifetime of outdoor adventures.